Impaired Gas Exchange: Excess or deficit in oxygenation and/or carbon dioxide elimination at the alveolar-capillary membrane. Gas is exchanged between the alveoli and the pulmonary capillaries via diffusion. Diffusion of oxygen and carbon dioxide occurs passively, according to their concentration differences across the alveolar-capillary barrier. These concentration differences must be maintained by ventilation (air flow) of the alveoli and perfusion (blood flow) of the pulmonary capillaries. A balance between the two normally exists but certain conditions can alter this balance, resulting in Impaired Gas Exchange. Dead space is the volume of a breath that does not participate in gas exchange. It is ventilation without perfusion. Conditions that cause changes or collapse of the alveoli (e.g., atelectasis, pneumonia, pulmonary edema, and acute respiratory distress syndrome) impair ventilation. High altitudes, hypoventilation, and altered oxygen-carrying capacity of the blood from reduced hemoglobin are other factors that affect gas exchange. The total pulmonary blood flow in older patients is lower than in young subjects. Obesity in COPD and the impact of excessive fat mass on lung function put patients at greater risk for hypoxia. Smokers and patients suffering from pulmonary problems, prolonged period of immobility, chest or upper abdominal incisions are also at risk for Impaired Gas Exchange. The following are the common goals and expected outcomes for Impaired Gas Exchange. 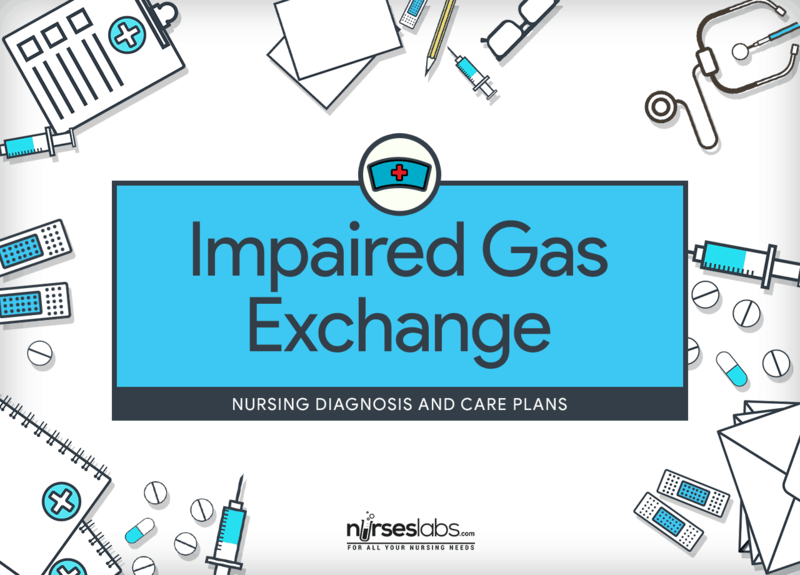 Patient maintains optimal gas exchange as evidenced by usual mental status, unlabored respirations at 12-20 per minute, oximetry results within normal range, blood gases within normal range, and baseline HR for patient. Patient maintains clear lung fields and remains free of signs of respiratory distress. Patient verbalizes understanding of oxygen and other therapeutic interventions. Patient participates in procedures to optimize oxygenation and in management regimen within level of capability/condition. Patient manifests resolution or absence of symptoms of respiratory distress. The patient’s general appearance may give clues to respiratory status. Observing the individual’s responses to activity are cue points in performing an assessment related to Impaired Gas Exchange. Assess respiratory rate, depth, and effort, including use of accessory muscles, nasal flaring, and abnormal breathing patterns. Rapid and shallow breathing patterns and hypoventilation affect gas exchange. Increased respiratory rate, use of accessory muscles, nasal flaring, abdominal breathing, and a look of panic in the patient’s eyes may be seen with hypoxia. Assess the lungs for areas of decreased ventilation and auscultate presence of adventitious sounds. Any irregularity of breath sounds may disclose the cause of impaired gas exchange. Presence of crackles and wheezes may alert the nurse to an airway obstruction, which may lead to or exacerbate existing hypoxia. Diminished breath sounds are linked with poor ventilation. Monitor patient’s behavior and mental status for onset of restlessness, agitation, confusion, and (in the late stages) extreme lethargy. Changes in behavior and mental status can be early signs of impaired gas exchange. Cognitive changes may occur with chronic hypoxia. Monitor for signs and symptoms of atelectasis: bronchial or tubular breath sounds, crackles, diminished chest excursion, limited diaphragm excursion, and tracheal shift to affected side. Collapse of alveoli increases shunting (perfusion without ventilation), resulting in hypoxemia. Observe for signs and symptoms of pulmonary infarction: bronchial breath sounds, consolidation, cough, fever, hemoptysis, pleural effusion, pleuritic pain, and pleural friction rub. Increased dead space and reflex bronchoconstriction in areas adjacent to the infarct result to hypoxia (ventilation without perfusion). Monitor for alteration in BP and HR. BP, HR, and respiratory rate all increase with initial hypoxia and hypercapnia. However, when both conditions become severe, BP and HR decrease, and dysrhythmias may occur. Assess for headaches, dizziness, lethargy, reduced ability to follow instructions, disorientation, and coma. These are signs of hypercapnia. Monitor oxygen saturation continuously, using pulse oximeter. Pulse oximetry is a useful tool to detect changes in oxygenation. An oxygen saturation of <90% (normal: 95% to 100%) or a partial pressure of oxygen of <80 (normal: 80 to 100) indicates significant oxygenation problems. Note blood gas (ABG) results as available and note changes. Increasing PaCO2 and decreasing PaO2 are signs of respiratory acidosis and hypoxemia. As the patient’s condition deteriorates, the respiratory rate will decrease and PaCO2 will begin to increase. Some patients, such as those with COPD, have a significant decrease in pulmonary reserves, and additional physiological stress may result in acute respiratory failure. Monitor the effects of position changes on oxygenation (ABGs, venous oxygen saturation [SvO2], and pulse oximetry. Putting the most compromised lung areas in the dependent position (where perfusion is greatest) potentiates ventilation and perfusion imbalances. Consider the patient’s nutritional status. Certain conditions affect lung expansion. Obesity may restrict downward movement of the diaphragm, increasing the risk for atelectasis, hypoventilation, and respiratory infections. Labored breathing is present in severe obesity as a result of excessive weight of the chest wall. Malnutrition may also reduce respiratory mass and strength, affecting muscle function. Check on Hgb levels. Low levels reduce the uptake of oxygen at the alveolar-capillary membrane and oxygen delivery to the tissues. Monitor chest x-ray reports. Chest x-ray studies reveal the etiological factors of the impaired gas exchange. Assess the patient’s ability to cough out secretions. Take note of the quantity, color, and consistency of the sputum. Retained secretions weaken gas exchange. Evaluate the patient’s hydration status. Overhydration may impair gas exchange in patients with heart failure. Insufficient hydration, on the other hand, may reduce the ability to clear secretions in patients with pneumonia and COPD. Position patient with head of bed elevated, in a semi-Fowler’s position (head of bed at 45 degrees when supine) as tolerated. Upright position or semi-Fowler’s position allows increased thoracic capacity, full descent of diaphragm, and increased lung expansion preventing the abdominal contents from crowding. Regularly check the patient’s position so that he or she does not slump down in bed. Slumped positioning causes the abdomen to compress the diaphragm and limits full lung expansion. If patient has unilateral lung disease, position the patient properly to promote ventilation-perfusion. Gravity and hydrostatic pressure cause the dependent lung to become better ventilated and perfused, which increases oxygenation. When the patient is positioned on the side, the good side should be down (e.g., lung with pulmonary embolus or atelectasis should be up). However, when conditions like lung hemorrhage and abscess is present, the affected lung should be placed downward to prevent drainage to the healthy lung. Turn the patient every 2 hours. Monitor mixed venous oxygen saturation closely after turning. If it drops below 10% or fails to return to baseline promptly, turn the patient back into a supine position and evaluate oxygen status. Turning is important to prevent complications of immobility, but in critically ill patients with low hemoglobin levels or decreased cardiac output, turning on either side can result in desaturation. Encourage or assist with ambulation as per physician’s order. Ambulation facilitates lung expansion, secretion clearance, and stimulates deep breathing. If patient is obese or has ascites, consider positioning in reverse Trendelenburg position at 45 degrees for periods as tolerated. Trendelenburg position at 45 degrees results in increased tidal volumes and decreased respiratory rates. Consider positioning the patient prone with upper thorax and pelvis supported, allowing the abdomen to protrude. Monitor oxygen saturation, and turn back if desaturation occurs. Do not put in prone position if patient has multisystem trauma. Partial pressure of arterial oxygen has been shown to increase in the prone position, possibly because of greater contraction of the diaphragm and increased function of ventral lung regions. Prone positioning improves hypoxemia significantly. If patient is acutely dyspneic, consider having patient lean forward over a bedside table, if tolerated. Leaning forward can help decrease dyspnea, possibly because gastric pressure allows better contraction of the diaphragm. Maintain an oxygen administration device as ordered, attempting to maintain oxygen saturation at 90% or greater. Supplemental oxygen may be required to maintain PaO2 at an acceptable level. Avoid a high concentration of oxygen in patients with COPD unless ordered. Hypoxia stimulates the drive to breathe in the patient who chronically retains carbon dioxide. When administering oxygen, close monitoring is imperative to prevent unsafe increases in the patient’s PaO2 which could result in apnea. If the patient is permitted to eat, provide oxygen to the patient but in a different manner (changing from mask to a nasal cannula). More oxygen will be consumed during the activity. The original oxygen delivery system should be returned immediately after every meal. Administer humidified oxygen through appropriate device (e.g., nasal cannula or face mask per physician’s order); watch for onset of hypoventilation as evidenced by increased somnolence after initiating or increasing oxygen therapy. A patient with chronic lung disease may need a hypoxic drive to breathe and may hypoventilate during oxygen therapy. For patients who should be ambulatory, provide extension tubing or a portable oxygen apparatus. These measures may improve exercise tolerance by maintaining adequate oxygen levels during activity. Help patient deep breathe and perform controlled coughing. Have patient inhale deeply, hold breath for several seconds, and cough two to three times with mouth open while tightening the upper abdominal muscles as tolerated. This technique can help increase sputum clearance and decrease cough spasms. Controlled coughing uses the diaphragmatic muscles, making the cough more forceful and effective. Encourage slow deep breathing using an incentive spirometer as indicated. These technique promotes deep inspiration, which increases oxygenation and prevents atelectasis. Suction as necessary. Suction clears secretions if the patient is not capable of effectively clearing the airway. Airway obstruction blocks ventilation that impairs gas exchange. For postoperative patients, assist with splinting the chest. Splinting optimizes deep breathing and coughing efforts. Provide reassurance and reduce anxiety. Anxiety increases dyspnea, respiratory rate, and work of breathing. Pace activities and schedule rest periods to prevent fatigue. Assist with ADLs. Activities will increase oxygen consumption and should be planned so the patient does not become hypoxic. Administer medications as prescribed. The type depends on the etiological factors of the problem (e.g., antibiotics for pneumonia, bronchodilators for COPD, anticoagulants and thrombolytics for pulmonary embolus, analgesics for thoracic pain). Monitor the effects of sedation and analgesics on patient’s respiratory pattern; use judiciously. Both analgesics and medications that cause sedation can depress respiration at times. However, these medications can be very helpful for decreasing the sympathetic nervous system discharge that accompanies hypoxia. Consider the need for intubation and mechanical ventilation. Early intubation and mechanical ventilation are recommended to prevent full decompensation of the patient. Mechanical ventilation provides supportive care to maintain adequate oxygenation and ventilation. Schedule nursing care to provide rest and minimize fatigue. The hypoxic patient has limited reserves; inappropriate activity can increase hypoxia. Assess the home environment for irritants that impair gas exchange. Help the patient to adjust home environment as necessary (e.g., installing air filter to decrease presence of dust). Irritants in the environment decrease the patient’s effectiveness in accessing oxygen during breathing. Instruct patient to limit exposure to persons with respiratory infections. This is to reduce the potential spread of droplets between patients. Instruct family in complications of disease and importance of maintaining medical regimen, including when to call physician. Knowledge of the family about the disease is very important to prevent further complications. Support family of patient with chronic illness. Severely compromised respiratory functioning causes fear and anxiety in patients and their families. Reassurance from the nurse can be helpful.